More than 20 CPL locations are designated early voting sites for the April 2 run-off election. From March 18 to April 1, any Chicago voter may vote at any of these sites no matter where they live. Not registered to vote? Registration services are available at all early voting sites. 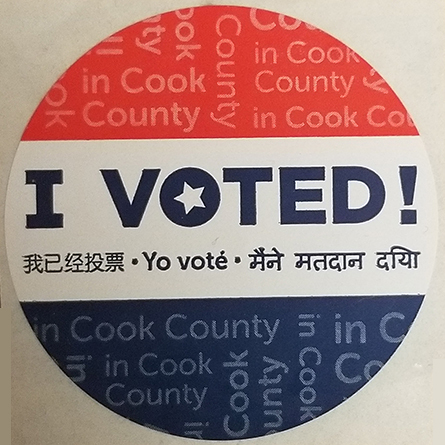 Any voter who needs to register for the first time or file a change of address or a change of name needs to show two forms of ID, one of which shows the voter's current address. Monday, March 18 to Saturday, March 23: 9 a.m. to 5 p.m.
Sunday, March 24: 10 a.m. to 4 p.m.
Monday, March 25 to Friday, March 29: 9 a.m. to 7 p.m.
Saturday, March 30: 9 a.m. to 5 p.m.
Sunday, March 31: 10 a.m. to 4 p.m.
Monday, April 1: 9 a.m. to 5 p.m.
For more information about early voting, please call the Chicago Board of Election Commissioners at (312) 269-7900.